He was down. Now, he's out. Quarterback Joe Dailey, who started every game for Nebraska in 2004 before struggling in practice this spring, said Monday he has asked for a release from his scholarship and will leave NU at the end of the semester. Husker head coach Bill Callahan confirmed he granted Dailey his release. Dailey said his meeting with Callahan on Monday was "very friendly." "It was brief, about 10 to 15 minutes," Dailey said. "We didn't get too intricate. It was professional. We just discussed each other's viewpoints and went from there." Dailey, a junior from Freehold, N.J., tumbled to No. 4 in the Nebraska quarterback pecking order last week after beginning spring practice March 23 at No. 1 on the depth chart, ahead of junior college transfer Zac Taylor. On April 2, Callahan said the race between Dailey and Taylor was too close to call. Then, on April 13  four days after the team's first full-scale scrimmage of the spring  NU offensive coordinator Jay Norvell announced Dailey had dropped to No. 4 behind Taylor, sophomore Beau Davis and redshirt freshman Joe Ganz. Sophomore Jordan Adams was No. 5. "There were five guys going for one spot," Dailey said Monday. "I approached the situation this spring like I do everything. I felt I was prepared. But things didn't fall into place as I hoped they would." Dailey said he was uncertain of his playing future and wanted to concentrate on academics. However, Dailey's high school coach said the process of finding Dailey a new football home is well under way. "I've started the film-distribution process," said Rich Hansen of St. Peter's Prep in Jersey City, N.J. "About eight schools will be getting film of Joe, and probably by about Wednesday, I'll have the exact schools (determined)." Callahan, in a prepared statement, said he and Norvell conveyed to Dailey on Monday that NU's competition at quarterback remains open. "However, Joe feels it is in his best interest to explore other opportunities of playing at another institution," Callahan said. "We are disappointed in Joe's decision to leave our program. He is a quarterback who knows our offense after spending a year in our system. We have invested a great deal of time and energy in training him to be a successful quarterback at Nebraska. I have great respect for Joe as a person and as a player, and we appreciate his contributions to this program." The 6-foot-1, 205-pound Dailey, playing with reserve units, was 7-for-20 passing for 121 yards, with one interception, during Saturday's annual Red-White Spring Game. Hansen, who attended the scrimmage, said he spent nine hours watching Nebraska spring practice film last weekend and didn't feel Dailey received a fair shot during camp. "I don't feel they put him in a fair, competitive environment," Hansen said. "I've been in this business for 23 years, and I can tell when college coaches want to see a kid squeezed out of a scholarship." For instance, Hansen said, Nebraska's defense didn't blitz at all Saturday until Dailey had entered the game. Dailey, though, said he didn't notice if he was the only quarterback who was being blitzed. "I think I got as fair a shot as I could've gotten this spring," Dailey said. "Let's put it this way: I'm under the impression I got a fair shot. Quite frankly, it doesn't matter to me now." Dailey said there were "some private things" that took place that might have led to his demotion to No. 4. "The coaches had to do what they had to do  maybe to make me an example," Dailey said. "But I'm not going to bash those guys. There are no hard feelings. I appreciate the time they spent with me to cultivate my development as a quarterback." On April 11, Dailey dressed in full pads but never threw a single pass in practice. Although team trainers had cleared him to throw, Dailey said, his shoulder was sore from the April 9 scrimmage, and he told coaches he thought it might be unwise to risk further injury. "I don't think they were too happy about that," Dailey said. "My whole thing was, It's April, it's not August. It's not worth injuring myself further.' I'm sure it affected where I fell. "There might've been a few other minor issues, but I don't think it was enough to demote someone." Dailey played as a true freshman in 2003, meaning he'll have three years to play two if he transfers to a Division I-A school outside the Big 12. In order to be eligible to compete this season, Dailey would have to transfer to a lower division of NCAA football. Last season, Dailey struggled with the difficult challenge of taking over an offense that was vastly different from the one used by former Nebraska head coach Frank Solich. Dailey completed 49.4 percent of his passes for 2,025 yards and 17 touchdowns, with 19 interceptions, as the Huskers finished with a 5-6 record. Solich said Monday he would not comment on whether he had any interest in Dailey joining him at Ohio University, but did say: "We thought Joe had great potential coming out of high school to be an excellent quarterback in our system, with the potential to develop into a very good thrower. "Our system certainly would have had him running some option and play-action, but then also some three-step drop and five-step drop." 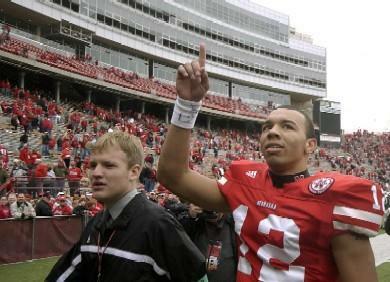 Dailey hoped Nebraska fans would remember him in a positive vein. "I hope they respect me for being a responsible and stand-up guy rather than the unfortunate quarterback I was in 2004," he said. Reach Steven M. Sipple at 473-7440 or ssipple@journalstar.com.